"'The one essential book in the field' In this pathbreaking study, Runyan reviews and responds to major criticism of psychobiography and of the case study method, and suggests criteria for evaluating and improving in-depth studies of individual lives. 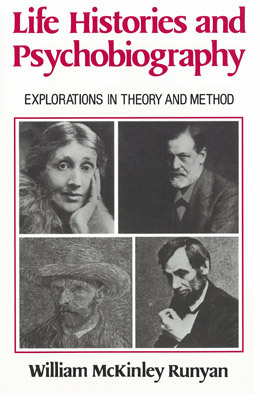 Theoretical points are vividly illustrated iwth examples from the lvies of (among others) Vincent Van Gogh, Emily Dickinson, Abraham Lincoln, Shakespeare, Malcolm X, Woodrow Wilson, Virginia Woolf, and several of Freud's classic case studies. "The most informative, clear, objective, and comprehensive book written on this topic to date. It is both the ideal text for a graduate course in psycho-history and the one essential book in the field which every library should have." "What contributions can psychology make toward understanding the course of individual lives and the flow of historical events? After an introduction which reviews the intellectual and institutional history of the field, chapters by distinguished contributors explore the uses of psychoanalysis, neo-analytic theory, and academic psychology in historical interpretation. 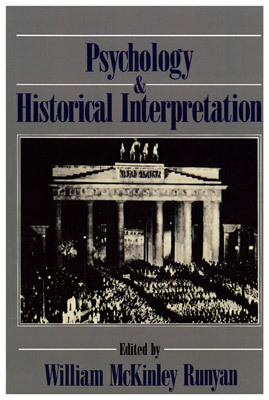 Substantive examples range from Joseph Stalin to Alice James, sexuality in Victorian England, the U.S. Continental Congress, and advances in psychohistorical studies of Adolf Hitler and Nazi Germany. The conclusion re-examines the conceptual foundations of psychohistory, outlining its differentiated internal structure and its relationships to adjacent fields such as psychological anthropology, historical sociology, and political psychology. The volume as a whole is intended to advance and deepen the debate about the relationships between psychology, biography, and historical interpretation." Also edited by Gardner Lindzey, PhD, director emeritus of the Center for Advanced Study in the Behavioral Sciences. Dr. Lindzey received his PhD from Harvard University in 1949 and subsequently was a professor at the University of Texas, where he was also vice president and dean of graduate studies. Dr. Lindzey was president of the American Psychological Association (1966-1967) and director of the Center for Advanced Study in the Behavioral Sciences from 1975 to 1989. 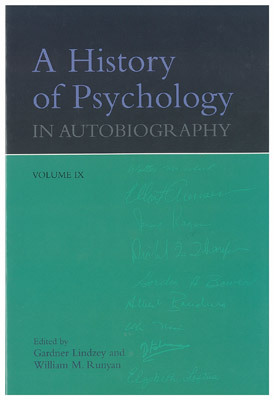 "The latest installment in the History of Psychology in Autobiography series takes readers through the personal and intellectual journeys of nine eminent people whose research has propelled the field of psychology into the 21st century. Each featured psychologist narrates how historical circumstances, collaborations, internal struggles, and even public conflict led him or her to open and develop various lines of research. Their stories are, by turns, humorous, creative, and courageous. Over the past fifty years psychology has expanded from behaviorism and psychoanalysis into cognitive and social theories of learning and brain-based models of behavior and memory. Contributors to this volume document their role in these and other movements, including personality theory and assessment and child development. Readers interested in applied psychology will find valuable insights in authors' accounts of their involvements in such diverse areas as education design, civil rights, courtroom testimony, media policy, and economics. Editors Gardner Lindzey and William M. Runyan have brought together a collection of essays that put a human face on the maturing science of psychology."